Israel appears to be enjoying a ‘quiet’ period, but below the radar, Israel is engaged in a covert war on five fronts. Israelis used to talk about the ‘next war’ and are familiar with warnings about imminent threats to the existence of the Jewish state or, alternately, theories which offer a ‘solution’ to our hundred-year-old conflict with the Arabs. Often, the various theories are based on wishful thinking or on Einstein’s definition of insanity. 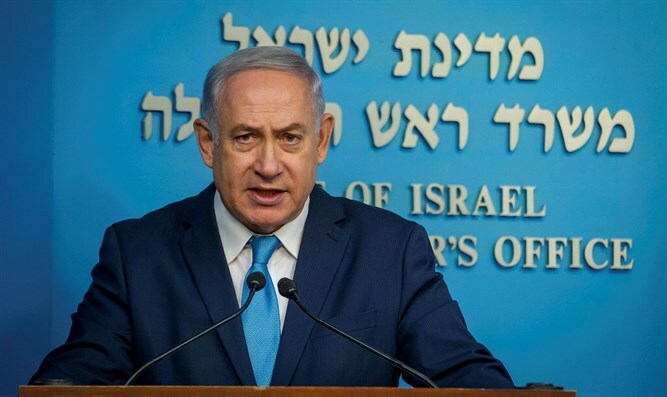 If Prime Minister Binyamin Netanyahu was to hold a ‘State of the Nation’ address in the Knesset today, he would most likely say Israel is strong, thriving and flourishing. He would add that he has managed to keep Israel out of the Middle Eastern quagmire once called “The Arab Spring” which has devastated countries and contributed to the rise of ISIS and Iran in the region. In short, Israel appears enjoying a ‘quiet’ period, that’s the general line of thinking. There’s more than meets the eye, however, and an assessment of the reality on the ground shows a very different picture and makes clear that Israel is already engaged in a war, a covert one. One could call it a “low-intensity conflict” but the fact is no day passes by without news which supports the conclusion that the IDF is fighting an asymmetrical war against implacable foes on five fronts. Over the last year we have witnessed the heating up of the northern border in both Syria and Lebanon, an uptick in Palestinian terror attacks, a renewal of rocket fire from Gaza, continuing attempts to infiltrate Israel via so-called terror tunnels and most recently a sharp increase in attempts to attack the Jewish communities in Judea and Samaria. For example, in Gush Etzion, the largest bloc of Jewish communities in Judea, there were three attempts by Arabs to infiltrate the city of Efrat and Carmei Tzur, a small Jewish village along Road 60 to Hevron, this over the past month alone. In all cases, local security and emergency teams managed to foil the terror attacks, but it is an indication that terrorists are heeding Fatah’s recent call to attack ‘settlers’, meaning Jews living in Judea and Samaria, the biblical heartland of Israel. Then there is Gaza, where Hamas again allows rocket fire against villages and towns in southern Israel and continues to organize infiltration attempts via tunnels and the security fence surrounding the enclave. The worsening of the humanitarian situation in Gaza could easily spark a new conflict with Israel according to Israeli security experts, and Hamas is reportedly again preparing for war as a way-out of its self-created Gazan swamp. Over the past few days, Hamas-leader Yahya Sinwar has raised the level of alert among the various Palestinian terror groups in the Gaza Strip and has moved the command echelon to underground facilities. He thinks Israel intends to launch a pre-emptive assault on Gaza within the next few days. Sinwar ordered the measures after the IDF stepped up its retaliatory attacks against Hamas targets in the Gaza strip and because he mistook a joint American-Israeli drill and an exercise by the IDF’s Paratroopers Brigade as preparation for imminent war. In reality, the joint American-Israeli drill, dubbed Juniper Cobra, is a biennial exercise which will this year focus on missile defense in a two-front scenario, while the Paratrooper drill could be a preparation for military action against Iran and its proxies. Another front where Israel is fighting a covert war is the Sinai Peninsula in Egypt where Wilayat Sinai, the local ISIS branch, continues to pose a serious threat not only to the regime of President el-Sisi but also to the Jewish State. The New York Times reported on Saturday that Israel has carried out airstrikes on positions of Wilayat Sinai a hundred times. The Israeli intervention in Sinai was coordinated with the el-Sisi regime, according to the NYT, and started after the ISIS affiliate downed a Russian civilian plane in northern Sinai in 2015, killing all aboard. The Israeli Air Force (IAF) uses drones and unmarked helicopters and warplanes in the campaign against Wilayat Sinai, which formerly operated under the name Ansar Bayt al-Maqdis. The NYT report, which was based on intelligence obtained from unnamed American officials, formed the first concrete evidence of the changing relationship between moderate Arab countries and Israel. This relationship is now based on the idea of the ‘enemy of my enemy is my friend’. Most attention in Israel, however, went to developments along the two northern fronts last week. On the Syrian Golan Heights, the Iranian-Russian-backed pro-Assad coalition launched an offensive against the ISIS-affiliated Jaysh Khaled bin al-Walid militia, which still controls a pocket of territory near the Yarmouk river. According to citizen-reporters in the area and the Syrian Observatory for Human Rights (SOHR), the IDF was also involved in the battle and launched rockets at the ISIS affiliate. SOHR later erased the report about Israel’s intervention. The Syrian army offensive against the Jihadists on the southern Golan comes after Assad’s forces re-conquered an area adjacent to the Druse town of Khader and the demilitarized zone near Mount Hermon in northwest Israel. The fifth front were Israel is facing huge challenges is Lebanon, as became apparent last week when Defense Minister Avigdor Liberman warned that Lebanese residents of Beirut would spend a lot of time in bomb shelters whenever Hezbollah and its allies dared to launch rockets at Tel Aviv and other Israeli population centers. Liberman made his remarks after Prime Minister Benyamin Netanyahu traveled to Moscow to discuss the growing Iranian threat via Hezbollah in Lebanon with Russian president Vladimir Putin. Netanyahu reportedly shared intelligence with Putin which proved Iran is building missile production facilities in Lebanon, and works on the production of advanced missile guidance systems which can convert crude rockets into precision weapons. These guided missiles form a strategic threat to Israel, and this is the reason the government in Jerusalem embarked on yet another diplomatic offensive to draw attention to the growing Iranian threat against the Jewish state from Lebanon and Syria. The latest diplomatic offensive by the Netanyahu government to draw international attention to Iran’s encroachment on Israel’s northern border via Hezbollah and Shiite militias in Syria which operate under the command of Qassem Soleimani, commander of the Quds Force of the Iranian Revolutionary Guards Corps (IRGC), is doomed to fail. While the Americans recently targeted Hezbollah by imposing new sanctions on the terror organization, they still support the Lebanese army despite evidence it has become another Iranian division controlled by Hezbollah. The European countries are even worse and in the main, still view Hezbollah as an umbrella organization with a banned military arm and a legitimate political division. As a result, Hezbollah is able to operate freely in most European countries, recruiting new members and raising funds. Israeli experts such as Dr. Ely Karmon of the International Institute for Counter-Terrorism in Herzliya now advocate another approach, in which Israel takes Iran directly to task about its belligerent activities in Syria and Lebanon. Karmon says Israel’s deterrence policy in Lebanon is not working because Iran and Hezbollah are not impressed by threats to destroy Lebanon’s infrastructure or the prospect Lebanese citizens will have to spend time in shelters in a possible future conflict. Karmon recalled how Iran finally gave in during the eight years it was at war with Iraq. “It should be remembered that the decision of Ayatollah Khomeini to accept the end of the eight-year Iraq-Iran war in 1988 came only after a wave of deadly missile bombings of Iran’s capital,” Karmon said. “Israel should threaten Tehran directly,” he asserted.